We took this approach to bring data from our server and make hierarchies work with flexmonster with database data. But we’ve reached five levels of nesting in our data and we began to see some mixed results within the sheets. Now we download the data correctly, but we don’t know if the problem happens when it goes through the compressor or the data parsing, but we have inconsistent data showing in my tables. As shown in attached print, “hortifruti” should be the most parent (department) of “maca”, “banana” and other fruits in that dataset. But, somehow, it confuses the children data as parent data and show them in the wrong hierarchy levels. Knowing that, we have tried many solutions: we’ve tried ordering them by parent, separating them by id or even using less nesting. However, everything we tried, gave us different results inconsistently. So we did go through forum and documentation, but nothing helped. What the procedures we have to take to make an self join table to show results consistently ? Thank you for writing to us and describing the problem in such detail. However, the problem is not reproducible on our side. Please send us the ocsv response that is sent from the compressor and the report.json file from your Flexmonster pivot table, so we may help you solve the problem. I was thinking, there is anyway to determine how hierarchy should work in code from the front end ? I mean, when hierarchies go five levels deep or more, the database truncate the column name, making it unreadable. 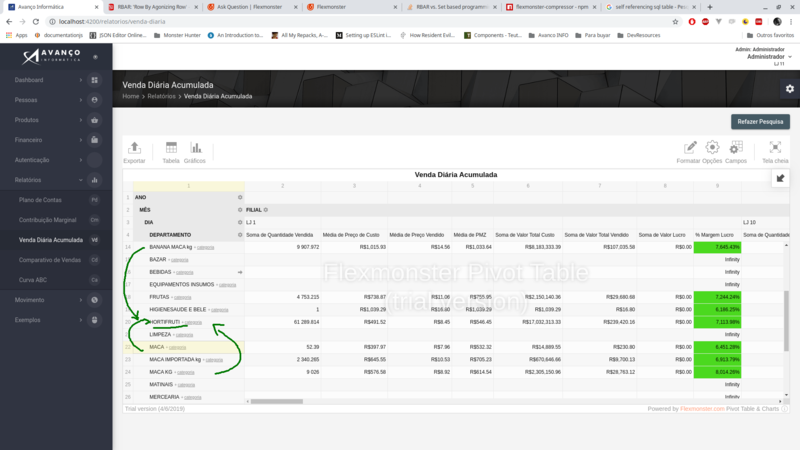 Instead of receiving the data from back end directly, there is a way to configure this in flexmonster itself ? Thank you for providing us with an example of your ocsv response and for the additional screenshots. We have noticed that the ocsv you sent us truly doesn’t behave as needed. Please send us a CSV data sample and the equal OCSV so we can investigate the issue. In Flexmonster the first line in CSV and OCSV files specifies the data types ( and how hierarchies should be shown). At the moment, this is the only way how to configure the hierarchy structure. Well, we’ve still tried to make it work, but no sucess. It is important to have both data to compare, because we suspect that the compressor might be making pointers to values as a way avoiding duplicates, but in doing so, it is discarding important data, wich may be present into the JSON. Although we are testing large datasets, we do know that we may need ElasticSearch to manage all the data in a fashionable way, but we’ll implement it later. For now, we’re working with smaller datasets ( about 100.000 rows ) to make it work as intended. Thank you for your reply and for sending us the sample OCSV and JSON. We managed to successfully download and analyze the files and with their help, we were able to reproduce the problem you have encountered. Our team will take a more detailed look at the problem and possible fix, and notify you about the result on the 23rd of April. A temporary workaround is to use only JSON (avoid using the compressor). Here is a link to our data types in JSON guide for more details.